Restricted in Assam, Odisha, Telagana and Gujarat. Unavailable in U.S.A, Canada, Australia and United Kingdom. PokerBaazi is India's number one trusted online gaming website that offers no-limit hold'em and pot-limit Omaha games, a large welcome bonus and plenty of promotions to keep matters interesting. PokerBaazi is the most trusted online poker website in India and one that has been very successful in garnering the attention of Indian poker players who want to win real money through online poker. Created in 2014, PokerBaazi has become India's number one online poker site thanks in part to allowing Indian poker players to win real money from playing poker online. Players earn VIP chips and can convert these into real cash as many times as they wish. The site offers more than a dozen deposit methods, including major credit cards and e-wallets, and while withdrawal options are limited to online transfers and cheques, withdrawals are fast and hassle-free. PokerBaazi offers a 100 percent up to INR.7000 welcome bonus. The minimum deposit is INR.100 and this will get you a INR100 bonus. Deposit INR 1,000 and you'll receive an INR 1,000 bonus. Deposit INR 7,000 for the maximum bonus. The bonus clears into your account after every hand played so that you have a constant trickle of funds heading to your poker account, which can keep you in the game longer. PokerBaazi has a six-tier loyalty programme that is designed to earn VIP points faster the higher up you climb. Everyone earns 10 VIP points for every 250 chips they wager, but these VIP points are multiplied by a factor of 1.0 to 1.5 depending on your VIP level. All VIP points expire six months after they are earned. In addition to the welcome bonus, PokerBaazi offers several promotions that frequently change to keep its players interested and in the search of value. There are big guaranteed tournaments throughout the week, the Baazi Super Sunday where four massive tournaments take place, the Baazi Grinders Series and a chance to win a place on the Haryana Hawks poker team. PokerBaazi currently offers cash games and tournament poker formats of no-limit hold'em and pot-limit Omaha. Cash games are available in six-max and nine-handed formats, while tournaments are available in a wide range of buy-in levels. PokerBaazi also offers Double of Nothing tournaments for those who like their tournaments with less variance. Customer support is available around the clock should you have any queries or questions. 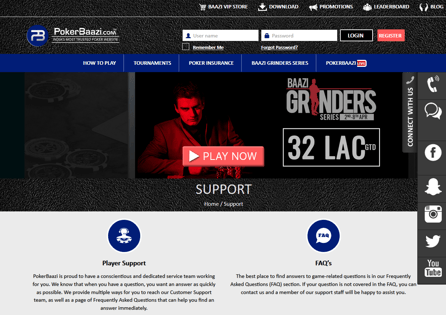 There is an FAQ section on the PokerBaazi site plus a contact form you can fill in and it will be sent to the customer support team.